The geography of Scotland is varied, from rural lowlands to barren uplands, and from large cities to uninhabited islands. Located in Northern Europe, Scotland comprises the northern one third of the island of Great Britain as well as 790 surrounding islands encompassing the major archipelagoes of the Shetland Islands, Orkney Islands and the Inner and Outer Hebrides. Scotland's only land border is with England, which runs for 60 miles (97 km) in a northeasterly direction from the Solway Firth in the west to the North Sea on the east coast. Separated by the North Channel, the island of Ireland lies 13 miles (21 km) from Mull of Kintyre on the Scottish mainland. Norway is located 190 miles (310 km) to the northeast of Scotland across the North Sea. The Atlantic Ocean, which fringes the coastline of western and northern Scotland and its islands, influences the temperate, maritime climate of the country. Scotland contains the majority of mountainous terrain in the UK. The topography of Scotland is distinguished by the Highland Boundary Fault – a geological rock fracture – which traverses the Scottish mainland from Helensburgh to Stonehaven. The faultline separates two distinctively different physiographic regions; namely the Highlands to the north and west and the Lowlands to the south and east. 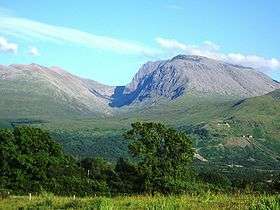 The more rugged Highland region contains the majority of Scotland's mountainous terrain, including the highest peak, Ben Nevis. Lowland areas, in the southern part of Scotland, are flatter and home to most of the population, especially the narrow waist of land between the Firth of Clyde and the Firth of Forth known as the Central Belt. Glasgow is the largest city in Scotland, although Edinburgh is the capital and political centre of the country. While the Lowlands are less elevated, upland and mountainous terrain is located across the Southern Uplands. An abundance of natural resources such as coal, iron and zinc contributed significantly to the industrial growth of Scotland during the 19th and early 20th centuries. Today, energy is a major component of Scotland's economy. Whilst Scotland is the largest producer of petroleum in the European Union, the production potential of renewable energy has emerged as an important economic and environmental issue in recent years. 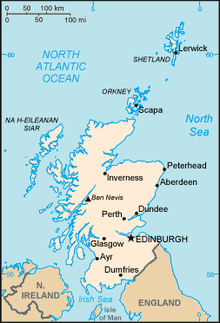 The land area of Scotland is 30,414 square miles (78,770 km2), 32% of the area of the United Kingdom (UK). The mainland of Scotland has 6,160 miles (9,910 km) of coastline. The geomorphology of Scotland was formed by the action of tectonic plates, and subsequent erosion arising from glaciation. The major division of Scotland is the Highland Boundary Fault, which separates the land into 'highland' to the north and west, and 'lowland' to the south and east. The Highlands of Scotland are largely mountainous, and form the highest ground in the UK: they are bisected by the Great Glen into the Grampian Mountains to the southeast and the Northwest Highlands. The Scottish Lowlands can be further subdivided into the Southern Uplands, an area of rolling farmland and high moorland, and the lowland farmland of the Central Belt and eastern Scotland. Scotland has an incomparable variety of geology for an area of its size. It is also the origin of many significant discoveries and important figures in the development of the science. The oldest rocks of Scotland are the Lewisian gneisses, which were formed in the Precambrian period, up to 3 billion years ago. They are among the oldest rocks in the world. During the Precambrian, the Torridonian sandstones and the Moine were also laid down. Further sedimentary deposits were formed through the Cambrian period, some of which metamorphosed into the Dalradian series. The area which would become Scotland was at this time close to the south pole..
During the Silurian period (439-409 Ma), the area which became Scotland was part of the continent of Laurentia. Across the Iapetus ocean to the south, was the continent of Baltica. The two continents gradually collided, joining Scotland to the area which would become England and Europe. This event is known as the Caledonian Orogeny, and the Highland Boundary Fault marks this stitching together of continents. Silurian rocks form the Southern Uplands of Scotland, which was pushed up from the seabed during the collision. The highlands were also pushed up as a result of this collision, and may have been as high as the modern-day Alps at this time. The Old Red Sandstones were laid down in low-lying areas during this period. Volcanic activity occurred across Scotland as a result of the collision of the tectonic plates, with volcanoes in southern Scotland, and magma chambers in the north, which today form the granite mountains such as the Cairngorms. During the Carboniferous period (363-290 Ma), Scotland lay close to the equator. Several changes in sea level occurred during this time. The coal deposits of Lanarkshire, and further sedimentary deposits, date from this time. More volcanic activity formed Arthur's Seat in Edinburgh, among other hills. By the Triassic, Scotland was a desert, the origin of large sandstone outcrops of the southwest. Although large deposits of Cretaceous rocks would have been laid down over Scotland, these have not survived erosion, as have the chalks of England. By the Tertiary period, the tectonic plates were again moving, separating into modern-day North America and Europe with the creation of the Atlantic Ocean. The split occurred to the west of Scotland, leaving a chain of former volcanic sites through the Hebrides, including Skye and St. Kilda. This was the last period of rock formation in Scotland. It is often yet incorrectly stated that John o' Groats is the most northerly point of mainland Scotland. The pre-Union phrase "John o' Groats to Maidenkirk" was the Scottish equivalent of the British Land's End to John o' Groats. The geographical centre of Scotland lies a few miles from the village of Newtonmore in Badenoch, far to the north of the modern population heartlands. The geographical centre of the mainland alone lies near the peak of Schiehallion. The total land area of Scotland is 7,710,000 hectares. Grasses and rough grazing account for 67% of the land area, forest and woodland 17%, urban development 8%, crops and fallow 7%, and other agricultural land accounts for 2%. Scotland contains the most mountainous terrain in Great Britain. Much of the highest uplands lie to the north and west of the Highland Boundary Fault in the Northwest Highlands and Grampian ranges. The jagged Cuillin, on the Isle of Skye, represents a major mountain range that is not located on the Scottish mainland. Located at the western end of the Grampian Mountains, at an altitude of 1,344 m (4,409 ft), Ben Nevis is the highest mountain in Scotland and Great Britain. Ben Macdui and Braeriach are, respectively, the second and third tallest peaks in Scotland. Both are located in the Cairngorms, a mountain range in the eastern Highlands which is the highest upland area in Britain. In the south of Scotland lie the Southern Uplands, a vast, rolling mountain chain that is less rugged and more forested than the Highlands. Shorter than the Highlands, the tallest mountain in the range is Merrick, at 843 m (2,766 ft). There are ranges of gentler, rolling hills even in the central lowlands of Scotland. Such ranges include the Ochil Hills, near Stirling, the Campsie Fells outside Glasgow, and the Lomond Hills in Fife. Mountains in Scotland are categorised by their height. Peaks over 3,000 ft (914.4 m) are known as Munros. There are 284 Munros in Scotland, all within the Highlands. Corbetts are peaks with an altitude of between 2,500 and 3,000 ft (762.0 and 914.4 m), with a relative height of at least 500 ft (152.4 m) . The classification of peaks in Scotland is kept under periodic review by the Scottish Mountaineering Club. 30A map of British Isles EEZs and surrounding nations. Internal UK borders are represented by thin lines.Scotland's EEZ is highlighted in blue. Large parts of the Scottish coastline are dune pasture, such as here at Traigh Seilebost on the Isle of Harris. Mainland Scotland has 6,160 miles (9,910 km) of coastline. Including the numerous islands, this increases to some 10,250 miles (16,500 km). The west coast in particular is heavily indented, with long promontories separated by fjordlike sea lochs. The east coast is more regular, with a series of large estuarine inlets, or firths, and long sandy beaches, for example at Aberdeen. Much of the Scottish coastline consists of a machair formation, a dune pasture land formed as sea levels subsided. The east coast has several significant estuaries and other nature reserves including the Ythan Estuary and Fowlsheugh, both of which have been designated as Important Bird Areas. 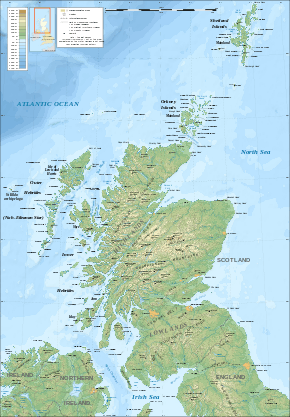 Scotland has some 790 islands, most of which are located off the northern and western coast of the country. The northern and western islands of Scotland can be found in three main groups: Shetland, Orkney and the Hebrides which can be divided into the Inner Hebrides and the Outer Hebrides. Shetland and Orkney, together with Fair Isle and Stroma are referred to as the Northern Isles. With a total land area of 860 square miles (2,200 km2) Lewis and Harris (referred to as two islands but actually just one) is the largest island surrounding Scotland. Many of these offshore islands are swept by strong tides, and the Corryvreckan tide race between Scarba and Jura is one of the largest whirlpools in the world. Other strong tides are to be found in the Pentland Firth between mainland Scotland and Orkney, and the Grey Dog between Scarba and Lunga. There are also numerous clusters of islands in the Firth of Forth and the Firth of Clyde and in freshwater lochs such as Loch Lomond and Loch Maree. Outlying islands include St Kilda and Rockall the status of which is disputed. Scotland's islands have a varied topography. Mull, Skye and Arran are noted for their mountainous terrain, whilst Tiree, Coll and most of the Shetland group are flat or low lying. Striking topographical differences can be seen within island groups themselves; in Orkney, the Island of Hoy is hillier and more rugged than surrounding islands and Harris is distinctive in being more mountainous than the islands of Lewis, North Uist, South Uist and Barra, in the Outer Hebrides. 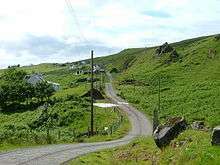 Islay's terrain is gentle and rolling; however, its neighbor Jura is mountainous and rugged. Rùm and Eigg display jagged terrain; nearby Canna and Muck are flatter. The watershed between river systems flowing west to the Atlantic Ocean and east into the North Sea is 745 miles (1,199 km) long. Freshwater bodies in Scotland are known as lochs, with the exception of the Lake of Menteith and one or two man-made "lakes". 90% of the standing fresh water volume of Great Britain lies within Scotland. Loch Lomond is the largest freshwater body in Britain by area, although with a capacity of 1.78 cubic miles (7.4 km3) Loch Ness is the most voluminous. The water in Loch Ness is nearly double that of all the lakes of England and Wales combined, and is by volume the largest lake in the British Isles. Scotland's only land border is with England, and runs for 60 miles (97 km) between the basin of the River Tweed on the east coast and the Solway Firth in the west. The Atlantic Ocean borders the west coast and the North Sea is to the east. The island of Ireland lies only 19 miles (31 km) from the southwestern peninsula of Kintyre; Norway is 190 miles (310 km) to the east; the Faroes, 170 miles (270 km) to the north; and Iceland, 460 miles (740 km) to the northwest. Climate graph for Edinburgh. Mild temperatures and evenly distributed rainfall, throughout the year, are characteristic of Scotland's temperate, maritime climate. The climate of Scotland is temperate and very changeable, but rarely extreme. Scotland is warmed by the North Atlantic Drift and given the northerly location of the country, experiences much milder conditions than areas on similar latitudes, such as Labrador in Canada—where icebergs are a common feature in winter. Average temperatures are lower than in the rest of Great Britain, with the coldest ever UK temperature of −27.2 °C (−17.0 °F) recorded at Braemar in the Grampian Mountains, on 10 January 1982 and also at Altnaharra, Highland, on 30 December 1995. Winter maxima average 5.0 to 5.7 °C (41.0 to 42.3 °F), with summer maxima averaging 14.9 to 16.9 °C (58.8 to 62.4 °F). Western coastal areas of Scotland are warmer than the east and inland areas, due to the influence of the Atlantic currents, and the colder surface temperatures of the North Sea; however, during rare hot spells, the west is cooler than the east. The highest temperature recorded was 32.9 °C (91.2 °F) at Greycrook in the Scottish Borders on 9 August 2003. Areas such as Inverewe Garden in the northwest and the Logan Botanic Garden in the southwest have warm enough microclimates to support palm trees. Rainfall totals vary widely across Scotland—the western highlands of Scotland are one of the wettest places in the UK with annual rainfall up to 4,577 mm (180.2 in). Due to the mountainous topography of the western Highlands, this type of precipitation is orographic in nature, with the warm, wet air forced to rise on contact with the mountainous coast, where it consequently, cools and condenses, forming clouds. In comparison, much of eastern Scotland receives less than 870 mm (34.3 in) annually; lying in the rain shadow of the western uplands. The town of Dunbar, east of Edinburgh, has an annual rainfall of merely 560.18 mm (22.05 in), less than Barcelona. Snowfall is less common in the lowlands, but becomes more common with altitude. Parts of the Highlands have an average of 36 to 60 snow days per year, while some western coastal areas have between 0 and 6 days with snow a year. Scotland's snowiest spot is the Cairngorm mountain range. The Hebridean island of Tiree received a total of 329 hours of sunshine in May 1946 and again in May 1975, the highest number of sunshine hours ever recorded in one month in Scotland. On the longest day of the year there is no complete darkness over the northern isles of Scotland. Lerwick, in Shetland, has four hours more daylight at midsummer than London, although this is reversed in midwinter. Annual average sunshine totals vary from as little as 711–1140 hours in the Highlands and the north-west up to 1471–1540 hours on the extreme eastern and south-western coasts. In common with the rest of the British Isles, wind prevails from the south-west, bringing warm, wet and unstable air from the Atlantic. The windiest areas of Scotland are in the north and west, with parts of the Outer Hebrides, Orkney and Shetland experiencing over 30 days with gales per year. Vigorous Atlantic depressions, also known as European windstorms, are a common feature of the autumn and winter in Scotland. According to the General Register Office for Scotland, the total population of Scotland stood at 5,168,500 in June 2008, an increase of 2.1% since the census of April 2001. Scotland's share of the United Kingdom population has been declining in recent years and stands at just over 8.5% due to differential rates of growth in the home nations. However an increasing birth rate and higher levels of inward migration to Scotland have reversed the decline and contributed to the recent population growth. Compared with the rest of Europe, Scotland has a low population density at 65 people per square kilometre. However Scotland is a highly urbanised country, with 82% of the population living in settlements of 3,000 people or more. As a result, the majority of the population live in the Central Lowlands of Scotland, surrounding the chief cities of Glasgow and Edinburgh. Other concentrations of population include the northeast coast of Scotland - principally surrounding the city of Aberdeen and its environs - and around Inverness. With a population density of 8 people per square kilometre, the Highlands are the most sparsely populated part of the country, and one of the most sparsely populated areas in Europe. In these areas, the population is scattered in villages, small towns and isolated farmsteads or crofts. Nearly 100 of Scotland's islands are inhabited, the most populous being Lewis with 16,782 people resident in 2001, primarily concentrated in Stornoway, the only burgh of the Outer Hebrides. Other island populations range down to very low levels on certain small isles. Between 1991 and 2001, the total number of people living on Scotland's islands fell by 3%. Conversely, islands such as Tiree, Skye and Eigg experienced increases in their respective populations over the same decade. There are seven cities in Scotland; Glasgow, Edinburgh, Aberdeen, Dundee, Inverness, Perth and Stirling. The 2001 census identified Glasgow as being the largest city in Scotland, with a total population of 629,501, while the Scottish capital, Edinburgh had a population of 448,624, in the same year. Between 1991 and 2001, the populations of Edinburgh and Stirling grew by 2.9% and 6.5% respectively. Inverness experienced population growth of over 10% during the same period. At the same time, Glasgow, Dundee and Aberdeen all witnessed population decline. Aside from the cities, the greatest intra-census population growth was experienced in the local authorities of West Lothian, East Lothian, Aberdeenshire and Perth and Kinross. The Western Isles saw a 9.8% decrease in population between 1991 and 2001. The territorial extent of Scotland has been relatively unchanged since the late 15th Century. The territorial extent of Scotland is generally that established by the 1237 Treaty of York between Scotland and England and the 1266 Treaty of Perth between Scotland and Norway. Exceptions include: the Isle of Man, which having been lost to England in the 14th century is now a crown dependency outside of the United Kingdom, the acquisition of Orkney and Shetland from Norway in 1472, and the permanent recovery of Berwick by England in 1482. Originally an independent country, Scotland joined with England to form the Kingdom of Great Britain in 1707 with the Acts of Union. Between 1889 and 1975 Scotland was divided into burghs and counties, which were replaced by regions and districts. Since 1996, for the purposes of local government, Scotland has been divided into 32 council areas. Rockall, a small and uninhabitable rocky islet in the North Atlantic, was annexed by the UK in 1955 and later declared part of Scotland by the Island of Rockall Act 1972. However, the legality of this claim is disputed by the Republic of Ireland, Denmark and Iceland and it is probably unenforceable in international law. As one of the constituent countries of the United Kingdom, Scotland is represented by Members of Parliament at the Parliament of the United Kingdom at Westminster, London. In 1997 a referendum was held, and the people of Scotland voted for the establishment of a devolved Scottish Parliament in Edinburgh. The new parliament has the power to govern the country on Scotland-specific matters and has a limited power to vary income tax. The United Kingdom Parliament retains responsibility for Scotland's defence, international relations and certain other areas. A Scottish independence referendum was held in September 2014, at which time independence was rejected. However, due to the Brexit result in which Scotland voted to stay in the Eu (62%); there could be a second independence referendum. The gross domestic product (GDP) of Scotland in 2006 is estimated to have been £124 billion, resulting a per capita GDP of approximately £24,000. Major industries include banking and financial services, steel, transport equipment, oil and gas, whisky, and tourism. ↑ "Scotland". Encyclopaedia Britannica. Retrieved 2007-08-16. 1 2 Munro, D (1999). Scotland Atlas and Gazetteer. Harper Collins. pp. 1–2. ↑ North Channel, Encyclopedia Britannica. Retrieved 2016-05-02. 1 2 3 4 5 6 7 8 9 "Met Office: Scottish climate". Met Office. 2001. Archived from the original on 2007-05-27. Retrieved 2007-08-20. ↑ "Overview of Highland Boundary Fault". Gazetteer for Scotland, University of Edinburgh. Retrieved 2007-08-23. 1 2 "Loch Lomond to Stirling - the Highland Line". Scottish Natural Heritage (SNH). Retrieved 2007-08-23. ↑ "Mid 2004 Localities estimates - Localities in descending order of size" (PDF). General Register of Scotland (GROS). 2004. Retrieved 2007-08-23. 1 2 "A vision for the future of energy in Scotland". Speech by the Minister for Enterprise, Energy and Tourism, Jim Mather. Scottish Executive. 2007-05-23. Retrieved 2007-08-24. ↑ See "The 'Where Are We' page" highlandhostel.co.uk. Retrieved 22 September 2007. ↑ National Statistics (2004). UK 2005. The Official Yearbook of the United Kingdom of Great Britain and Northern Ireland. London: The Stationery Office. p. 279. ISBN 0-11-621738-3. 1 2 3 4 "Mountains - The Key Facts". Scottish Mountaineering Club. Retrieved 2009-09-13. ↑ Machair Profile Archived 20 May 2007 at the Wayback Machine. ↑ "Scotland in Short" (PDF). Scottish Executive. Retrieved 2007-08-16. ↑ BBC News online: Scotland's watershed route mapped out for hikers. Includes map of the watershed. Retrieved 15/4/2011. ↑ "Land Cover Change in Scotland". SNH. Retrieved 6 September 2009. ↑ Murray and Pullar (1910) "Lochs of the Ness Basin" Pages 381-85, Volume II, Part II. National Library of Scotland. Retrieved 2 January 2010. ↑ "Scotland 1971-2000 averages". Met Office. 2001. Archived from the original on 30 April 2004. Retrieved 2007-08-20. ↑ "Mean Temperatures Annual Average". Met Office. 2001. Archived from the original on 3 January 2014. Retrieved 2007-08-20. 1 2 "Rainfall Amount Annual Average". Met Office. 2001. Archived from the original on 19 July 2013. Retrieved 2007-08-20. ↑ Wheeler, Dennis; Mayes, Julian (1997). Regional Climates of the British Isles. Routledge. Retrieved 2007-08-21. 1 2 "Days of Snow Lying Annual Average". Met Office. 2001. Archived from the original on 9 August 2007. Retrieved 2007-08-20. ↑ "Sunshine Duration Annual Average". Met Office. 2001. Archived from the original on 28 July 2014. Retrieved 2007-08-20. ↑ "Lichens - The Exceptional Scottish climate". Scottish National Heritage (SNH). 2001. Retrieved 2007-08-21. 1 2 "Scotland's population continues to rise". General Register Office for Scotland. 2009-04-28. Retrieved 2010-04-05. ↑ "Population projections (2002 based)". General Register Office for Scotland. 2006-03-24. Archived from the original on 2007-09-27. Retrieved 2007-08-17. ↑ "More births than deaths in 2006". General Register Office for Scotland. 2007-03-06. Archived from the original on 2007-06-03. Retrieved 2007-08-28. ↑ "Population up for third consecutive year". General Register Office for Scotland. 2006-04-27. Archived from the original on 2007-04-25. Retrieved 2007-08-17. 1 2 "Review of Scotland's cities - the analysis". Scottish Government. January 2003. Retrieved 2007-08-17. 1 2 "A framework for maternity services in Scotland". Scottish Government. February 2001. Retrieved 2007-08-17. 1 2 3 4 "Number of residents and households on all inhabited islands" (PDF). General Register Office for Scotland. 2003-11-28. Archived from the original (PDF) on 27 September 2007. Retrieved 2007-09-08. 1 2 3 4 5 "Revised Mid-year Population estimates - 1982-2000". General Register Office for Scotland. Retrieved 2007-09-08. ↑ Alistair Nicolson (2004-03-19). "Scottish Economic Report March 2004 - Demographic Change in the Highlands and Islands". Scottish Government. Retrieved 2010-04-05. ↑ "Uniting the Kingdoms?" National Archives. Retrieved 21.11.06. ↑ "On this day - 21 September" bbc.co.uk. Retrieved 22 September 2007. "In 1972 the Isle of Rockall Act was passed, which made the rock officially part of Inverness-shire, Scotland." ↑ "Daily Hansard" 24 June 1997. Parliament.uk. Retrieved 22 September 2007. ↑ Oral Questions to the Minister of Foreign Affairs in the Dáil Éireann, 1 November 1973 Retrieved 17.01.2007. ↑ Scottish Economic Statistics 2008 (PDF), Edinburgh: Scottish Government, 2008, ISBN 978-0-7559-5855-9, retrieved 2011-06-11 p. 15, table A1.8a.